It is magic my grandpa used to say Gathered around the fire at the end of the day Run inside and get the drum, he would say Because once again, it was that time of day. Yes, it's that time of day, a man who was intrinsically linked to his drum, as if his life depended on it, and indeed his voice…departs. It has even become difficult I am sure for most to visualize Ras Algie without his drums, his African drums. Whether it was with Teyat Pawol, Dominica's writers and poets, groups such as the Pointe Michel group, alongside Ras Mo, during Independence, on the side of the streets, as props to Kaiso, the drums were forever present with the be-locked mystical stoic facial expressions of Ras Algie. No one knew him as Algernon Adams, nor as the brother of the retired education officer Hartley Adams; his education was not routed in math and English or Western science but it was all about the motherland Africa. A poet and actor in his own right and a local herbalist who concocted his own potions for varying ailments. He educated those who cared to listen in the use of herbs for natural healing. I fondly remembered him in the Dominica Writer's Guild best years of the 80's and early 90s, when Frontline Book Store served as a hub which galvanized writers and performing poets alike, a gathering and reasoning point where one could locate Ras Algie engaged in conversation with Guild coordinator Harold Sealy or just reminiscing about life and the performing arts. He was a painter, a sign painter, a designer of sorts always infused with an African touch, his home his identity. 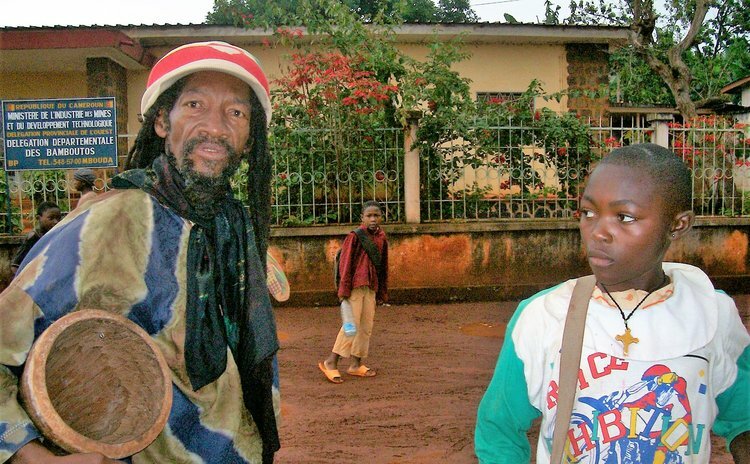 As a Rasta man he realized a dream many in the region may never fulfill in their lifetime-a physical journey to the motherland through Cameroon. This was where he found his wife who accompanied him back to Dominica. Alex Bruno told me soon after they returned from that journey of how well received Ras Algie was. He was revered as some African king particularly as his potions was used to good effect in Cameroon making that full circle re-connection to the homeland. Three weeks before his demise I was looking for a traditional drummer for an engagement as a last minute replacement for the one who bailed out on a contracted engagement. Immediately I thought why not Ras Algie. On entering his home I saw the pitiful figure which stopped me in my tracks. I knew and believed he had overcome a recent condition which required travel and eventual surgery. But since then he seem to have overcome and was even part of my "Rhythm & Rhymes" show where he featured on his indomitable drums. So, I did not know he was ailing. I said I would return after the engagement because I was already pressed for time. I really could not, or would not. Can't bear the stare of death. Still on reflection I am happy I put up his name and saw him recognized by the Division of Culture a few years ago before for his decades of dedication to the African drum; goat skin or congas he played it all. This I know meant a lot to him. Three days from this publication, on October 19th his mortal remains goes back from whence it came…Ethiopia, his heaven amidst the salute of a hundred drums…well done Ras Algie, well done.